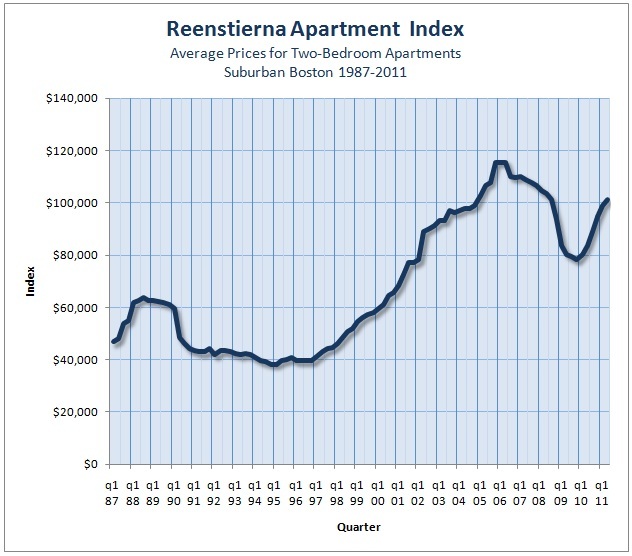 We have updated the Reenstierna Suburban Boston Apartment Index. It is posted here as well as at the "Index" link on the menu bar. The chart reflects the rebound in apartment prices from 2009 to 2010-2011 in Greater Boston. The chart makes use of "paired sales" (sales and resales of the same property) to produce data points, which become the line chart that is shown. The data come from suburban rather than urban locations, including suburbs from Dedham and Arlington to Route 495. Sales from locations in Boston and smaller cities (Lawrence, Lowell, Chelsea) are not included. A graph of price trends in some of these would show a weaker rebound or a continuation of prices at the low end reached in 2009.